Dr. Johnson grew up in central California and southern Idaho. 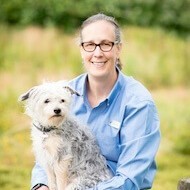 She graduated from Washington State University’s School of Veterinary Medicine in 1993. She enjoys solving medical problems and helping pets, and people, live happier and more comfortable lives. Juanita Bay patients are most fortunate to have the benefit of her experience as an emergency doctor and rehabilitation doctor, in addition to her general practice knowledge. Dr. Johnson and her spouse Patty Ellen share their home with dogs Gromit and Lucile O Ball and Beep the cat, who just happens to have 24 toes. When not at work helping the pets and people at Juanita Bay, Dr. Johnson can often be found bicycling and pursuing her enjoyment of fixing things- watches, vintage radios, lawn mowers…..we think that makes her a tinkerer! She is an American history buff, comes from a past that includes being on the school math team and has the distinction of being an all-American basketball player.